Join CSLTV’s Rev. Katherine Economou and Ministerial Intern, Charlene Kussner for this powerful class, where you will examine the basic principles of Science of Mind and uncover old beliefs that may be limiting your life right now. Learn in a safe and supportive environment, where you can deepen your spiritual understanding at your own pace and discover the hidden riches within. Spiritual Mind Treatment, meditation and other spiritual practices are taught, giving you options for your own daily practice. This class is experiential with many exercises to assist you in embracing and incorporating Science of Mind principles in practical ways. 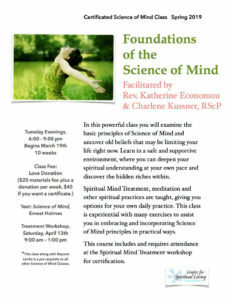 This course includes and requires attendance at the Spiritual Mind Treatment workshop for certification. Class Fee: Love Donation of $65 ($20 for class and $45 for class certificate) materials fee plus a donation per week. *This class along with Beyond Limits is a pre-requisite to all other Science of Mind Classes. **Enrollment in this class is unavailable after the 2nd week.